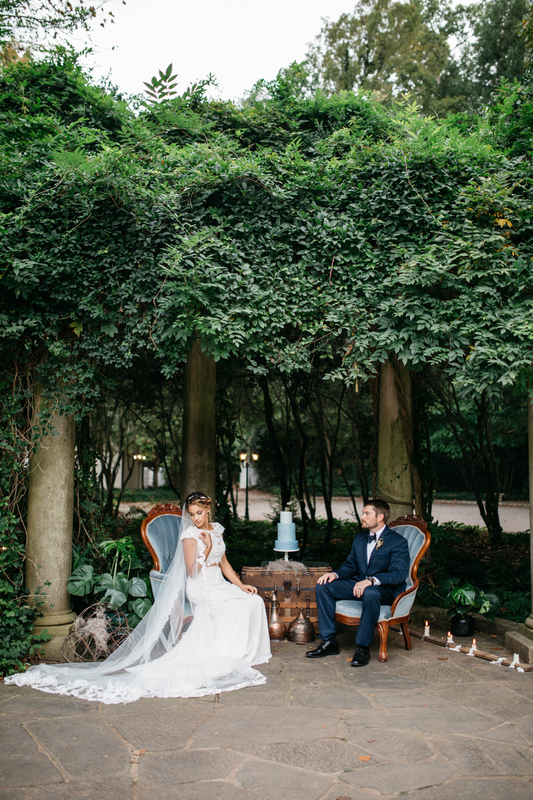 In September, I got the opportunity to photograph an absolutely beautiful styled shoot in the heart of Decatur at one of my favorite locations, Cator Woolford Gardens. Not only was the styling lovely, but I got to work with some of my favorite people in the industry as well as meet the most adorable couple, Casey & Jerrod. They met in Atlanta through mutual friends, all of whom wondered afterward why they hadn’t thought of “matchmaking” these two before. The bride and groom had admired each other’s photos on social media – not just for the mischievous spirit she always seemed to convey in pictures or the warm smile he always turned toward the camera – but for their destinations. He was jealous of her business trip to London; she envied his hiking trip through Iceland. When they finally got together, each was glad to finally have a partner with equal adventure in their soul. Their first weekend trip: A summer weekend in Maine. Their first roadtrip: Spring in Texas hill country. They spent the Fall in Alberta, the winter holidays in Rome; they’ve strolled through lavender fields in Georgia and grape vines in Bordeaux. And now they’ve come home to start their greatest adventure of all as newlyweds! And now for the wedding story through my lens :).